Gout is a medical condition where uric acid crystals accumulate in the joints and extremities of the body causing a person to suffer from severe pain that is also accompanied by redness and tenderness in the joints. Gout is a form of inflammatory arthritis which can affect near about anyone. The joint of the big toe is generally the most affected, however other body parts such as the ankles, knees, wrists can also be affected as well. Our body breaks down purines, a naturally occurring compound into uric acid. Normally the kidneys act upon the uric acid and allow for its easy excretion out of the body through urine. However, in certain people their body produces excess of uric acid which the kidneys are not able to process properly. 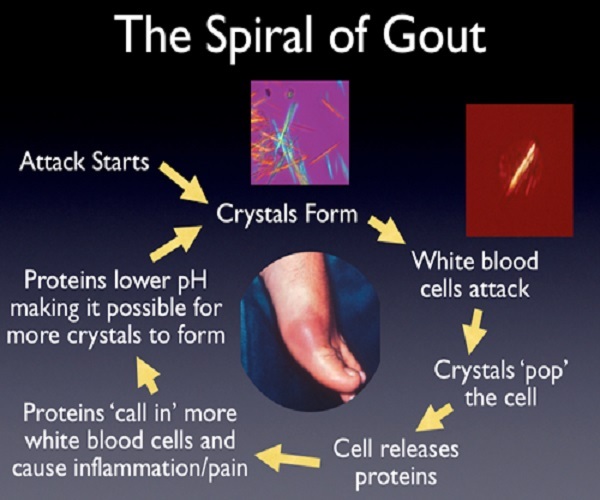 This result in the accumulation of uric acid in the body leading to a condition called gout. When this happens the uric acid crystallizes and forms sharp needle like crystals that get deposited in the joints leading to painful swelling and inflammation. Drugs are available to treat gout, but people can try out certain home remedies that tackle the symptoms of gout head on. Those who suffer from chronic gout should consult a doctor to prevent the condition from getting serious. Apple cider vinegar has been used since centuries to treat gout. A person suffering from gout has excess of uric acid in his body. The acetic acid of apple cider vinegar when it enters the body propels our ph balance to turn alkaline thus it helps to neutralize the acidity of uric acid. Apple cider vinegar also reduces inflammation. Ideally one should take about 2-3 tablespoons of apple cider vinegar a day. However, if you find it to be strong then you can dilute it by adding water to it. Another way to treat gout is by using apple cider vinegar topically to the affected joint. Take a tub of warm water and add a cup of apple cider vinegar. Soak your feet in this solution for at least 20 minutes. Cherries are very effective against gout. They contain anthocyanin’s which help to reduce the inflammation and thus provide relief from the pain. Cherries, apart from preventing the reabsorption of urate by the body also ensure that the urate is excreted by the body in the form of urine. Thus cherries play an important role in decreasing the uric acids levels in the body. Due to Epsom’s salt properties of relaxing muscles, relieving pain and reducing swelling it becomes the ideal substance to treat gout symptoms. It is primarily due to the presence of magnesium and sulfur. Soaking the affected body part in a solution of Epsom salt can provide considerable relief to a person suffering from gout. Take a tub of warm water and add about 2-3 cups of Epsom salt. Now soak your toe for about 20 minutes or so or till the water turns cold. Do this about 3 – 4 times a week. If you wish, you can also make a compress by soaking a towel in Epsom salt solution and then tying the cloth around your affected joint. Not only will your pain be lessened but your muscles will also become relaxed. Ginger root’s anti-inflammatory properties help to treat gout symptoms well. There are many ways by which you can take ginger to treat gout. Including ginger in one’s daily diet is a good way to extract its benefits. Instead of your regular tea have ginger tea where ginger has been added to it. Drinking this tea daily will give you relief from the inflammation. Take fenugreek powder, turmeric powder and ginger root powder in equal proportions. Combine this mixture with warm water and drink it twice daily. You can make a paste of ginger root and apply it to the affected area. Leave this paste for an hour or so and then wash it off. Baking soda being alkaline in nature decreases the level of uric acid in the body providing you immense respite from the pain. Take half-a-teaspoon of baking soda and mix it to a glass of water. Drink this blend about 3- 4 times a day. However, do not take more than 4 times a day as it contains salt which can lead to a condition called alkalosis. Another option is to add the juice of a lemon to about half a teaspoon of baking soda and mix it with water. Lemons being alkaline in nature will decrease the uric acid levels in the body. Charcoal adsorbs uric acid; hence it is a great substance to treat gout symptoms. To a tub of water add some charcoal powder. Now place your affected body part, preferably the toe or ankle in it. Keep your toe submerged for at least 30 minutes to get relief. You can also make a charcoal paste and apply it to the respective body part that is affected by gout. Keep the paste for about 30 minutes and then rinse it off. Nowadays charcoal capsules are available in the market which helps reduce inflammation and ease the pain caused by gout but before you choose to take them kindly consult your doctor. This herb has been used since long to treat gout symptoms. You can use chicory root to get relief from gout. Take about 30 gms of chicory root and add it to boiling water. Drink this liquid 3-4 times a day to get substantial relief from your pain. You can also make a paste out of chicory root and apply to the affected region. Keep it for some time and then wash it off. This will reduce the swelling and decrease your pain. People with gout are advised to have a low-purine diet as our body synthesizes the purines in our body to produce uric acid, so the lesser the purine content in our body the better it is for a gout patient. Bananas are low in purine hence they should be consumed abundantly by a gout patient. 2-4 servings of banana a day should be sufficient to treat the gout symptoms. A lack of carbohydrates in one’s diet leads to an increase of ketones compounds in the body which ultimately raises the concentration of uric acid in the blood. The key is to use fruits which are low in purine and also contain low-fat carbohydrates and banana fits the bill perfectly. A cold compress applied on the joints and affected body parts can at times decrease the pain and inflammation. One must be however careful with this method as keeping the cold compress on for a long time might lead to crystallization of the uric acid. Therefore apply cold compresses for not more than 20 minutes at a time. Soak the affected body part in cold water for about 20 minutes at a time. Repeat this procedure many times during the day. If you have gout then have at least 8-10 glasses of water a day. Water will dilute the uric acid levels in the bloodstream and also flush out harmful toxins from the body. Celery has good anti-inflammatory properties and can thus provide substantial relief to a gout affected person. It can also eliminate uric acid from the body which makes it very potent. To boiling water add about a tablespoon of celery seed and boil it till it becomes smooth. Now drink this water at regular intervals. Spearmint and mullein are good against inflammation thus they can decrease the pain caused due to gout. Make a wrap of spearmint and apply it to the affected joint. Similarly you can use a poultice of mullein leaves and wrap around the joints to provide one relief. Mustard can also be used effectively against gout. Take some mustard seeds and grind them along with wheat flour and water to form a paste. Place this paste in a muslin cloth and pat it well so that it forms a plaster. Now apply some petroleum jelly to your joints and keep this plaster over it. For better results keep it overnight. Apples contain malic acid which nullifies the effects of uric acid in the body thereby reducing the pain and inflammation to a considerable extent. Apple preserve is very effective in treating gout. To make apple preserve, take a few slices of apples and simmer them in water till the apples turn brown and the mixture becomes thick in nature. Cool this mixture and store it in the refrigerator. Regularly have a few tablespoons of this preserve to keep gout symptoms in check. Stinging nettle is known to reduce inflammation as well as provide relief from joint pain. You can make a poultice of stinging nettle leaves and apply to your painful joints to get relief. Alternatively, you can make a tea by steeping dried nettle leaves in water and tea leaves and then drinking this tea.